The third Elton John release brought yet another style to the repertoire. Many of the complex orchestral arrangements from the Elton John album were dropped, and in their place is a more rustic, western style. This was done intentionally, with lyricist Taupin stating he was influenced by The Band's Music From the Big Pink, plus his adolescent fascination with the American West. It should be pointed out that although these influences are indeed present, Elton himself had not quite played to an American audience yet when this album was recorded. Elton did admit years later that this album was one of the most perfect unions of music and lyrics that he and Bernie had collaborated. Even the album artwork is packed with glorious western imagery and frontier style photographs. As far as overall quality, it's definitely one of his better pieces of work. It's a little bit harder than the last release, but not much. The songs Amoreena and Burn Down the Mission are among the best examples. Love Song is one of the few songs released that was not penned by Elton nor Bernie, and ironically one of the best songs featured. Composer Leslie Duncan provides backing vocals as well as acoustic guitar, the only instrument on the piece. Likewise, Talking Old Soldiers is Elton solo on piano and is a haunting ballad of veterans of conflicts long ago. 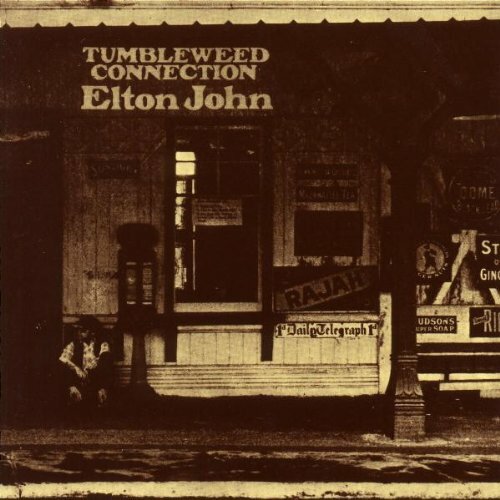 Other gems include Come Down in Time, probably one of the most underrated pieces in Elton's catalogue, Where To Now St.Peter?, a track that is extremely powerfull even if it hasn't aged particularly well, and Country Comfort, which pretty much sums up the theme of the overall album. The lack of a hit single did not prevent Elton from becoming an overnight sensation in America shortly after the album was released.